The new Audi A8 mini site is a paper made web. The new sport luxury berline adresses to a target not very familiar with Internet, so we created a direct and intuitive navigation. 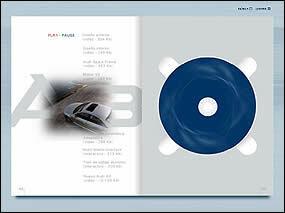 Through the catalog's pages videos and interactive demos of some of the most impressive car's features can be found. Design emphasizes the new A8 sporting and dinamic positioning, with pages that unfold into double pages and a little mini-book inside. All of these brings an interactive web paper catalog.